What is the Beantown Fall Classic? The Beantown Fall Classic is a team entry event featuring elite teams from North America at the 18U, 16U and 15U levels. There are also USPHL league games played at the NCDC level. Teams consist of players from the age of 18 and younger. The 18U Division is defined as a combined Jr. and 18U Division. All games labeled 18U/Junior in the schedule will be played using USA Hockey Youth Rules. This allows Jr. teams to play 18U teams and be in compliance. The 18U Division consists of some of the top Prep, Midget and Junior teams from all over North America. 18U teams will play out of NESC (Marlboro, MA) along with a few games at satellite rinks. All rinks are within 10-15 minutes of each other. Each team is guaranteed four games. Teams can of players from the age of 16 and younger. The 16U Division consists of some of the top Prep and Midget teams in North America. 16U teams will play out of NESC (Marlboro, MA) along with a few games at satellite rinks. All rinks are within 10-15 minutes of each other. Each team is guaranteed four games. Teams consist of players from the age of 15 and younger. All games labeled 15U in the schedule will be played using USA Hockey Youth Rules. 15U teams will play out of NESC (Marlboro, MA) along with a few games at satellite rinks.. All four rinks are within 10-15 minutes of each other. Each team is guaranteed four games. All teams must make reservations at a hotel through the link below. Teams can negotiate whatever terms they choose with the hotels. Contact MIKE ANDERSON for help with hotel information. 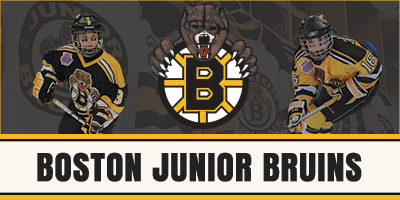 If your team is interested in participating in the event, contact Tournament Director Peter Masters at peter@bostonjuniorbruins.com with your intention of entering and fax in the tournament application to be reviewed. The team will then be notified of their status for the tournament. Q: Where will my team be playing? A: The tournament is played out to the New England Sports Center in Marlboro, MA as well as some overflow games at the three satellite rinks which are 10-15 minutes drive from NESC. Q: When will the schedule be released? A: The schedule will be sent to teams approximately one week before the start of the tournament. Q: Can my team make a request to play at a certain time? A: Yes. Requests need to be made and must be emailed to peter@bostonjuniorbruins.com when you make your application. We will try to accommodate all request, however not all can me meet. Requests made after your application has been submitted or at the last minute or after the schedule has been released will not be considered. Q: How far are the rinks to the closest airports? A: NESC is 40-45 minutes from Boston’s Logan Airport and 60 minutes from TF Green airport in Providence, RI. Q: Are there things for the players/parents to do in the area other than play? A: Yes. The city of Boston is within driving range for everyone. The city has many attractions, such as Bruin or Celtic games, shopping, food and other tourist attractions. Also there are plenty of colleges in the surrounding area for families to visit. Depending on the schedules, there are some college teams that may be playing at home that weekend which would provide a great time for players and their families. Q: Is the Beantown Fall Classic a USA sanctioned tournament? A: Yes and the tournaments sanction number has not been issued yet. Please check back in August.